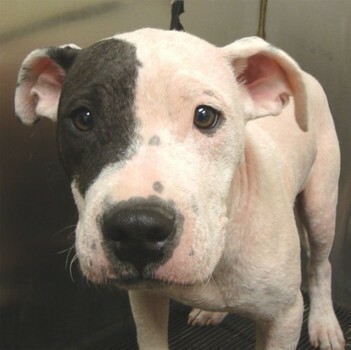 Snoopy is a 8 month old american bulldog that is full of love and affection. He came to us from the animal shelter and was unsure about his surroundings and what his new place was going to be. He is currently in foster care and is doing great, he is crate trained, house trained, he lives with small children and other dogs and it is going great. Snoopy does not get along with cats though. Snoopy is very eager to please his owners and wants someone to give him all the love and attention he deserves. When he is full grown Snoopy will be a medium to large dog. Snoopy loves to cuddle on the couch and be a couch potato or he has a great time playing with his toys. If you would like to consider giving Snoopy is forever home, he is available for adoption at any time and all we need is for you to click the link at the top of his bio to fill out an application. Snoopy comes up to date on shots, micro chipped, neutered, and current on heart worm prevention. REVIEWED AND UPDATED 07-05-2010 SNOOPY’S ADOPTION FEE IS $100 Snoopy is exclusively fed Natural Balance Ultra Premium Dog Food!